I feel like it's time to update my vanity/ blog photograph taking place. As you know my favourite colour is green so I really wanted to incorporate green into this area. I have been reorganising a lot and I just need my vanity/blog photo taking area to be set up and in place all the time. Let's start with the beautiful prints, I discovered a new website when I searched for 'gold pineapple print' on google (weird but haha) and came across the site Desenio - it has beautiful Scandinavian style prints and I love them all especially the ones I have picked out. The links for these are Emerald Diamond, Triangles, Pineapple, Typography - I would have these in all sort of sizes on my wall and I think it makes my wall more complete and have some dimension and colour. Muji draws - I do have a set of Muji draws already but since I have been buying more Colourpop Cosmetics I really need them to be beside me so I can easily reach for them. My current one is stored with lipsticks and lipliners so I will need to reorganise once I get a new set of Muji draws. I like the 5 drawers since it's acrylic, I can easily see the shades and it's suitable for all sizes of lipsticks and now my Colourpop goodies. H&M Holder - technically this is a napkin holder but who says we can't use this to store magazines. I have a pile of magazines on my desk and I just need my desk to be tidier so I have a clear background. This can also be used to store eyeshadow palettes if it's big enough. H&M Candle - nope I haven't smelt this but I love the green marble print, I know everyone is a fan of marble print right now but I like the green since it balances out my white desk and acrylic drawers. I'm sure I'm not the only one who buys a candle just for the jar haha. H&M Vase - this is something to add a little colour, I'm sure if one day I decide to buy some flowers I can pop it in here and actually use it. I might use to store my makeup brushes since I hid most of my boxes in the draw since I don't have space on my desk. Oliver Bonas Mirror Tray - I think this would be really nice to take some of my blog photos and also use to store my perfumes.I love the gold and glass since it has an antique feeling and it would compliment my emerald items. From Anthropologie I found this holder which is for tea lights, I like the hexagon shape and also goes with the Oliver Bona Mirror Tray. These are great for those who like to light scented tea lights and the mirror effect is going to make your room brighter. The last item is a wire basket , this is also from Anthropologie, it comes in all sorts of shapes and sizes, I feel like this is going to be great to put my skincare to keep it together and give the marble plate I have a rest. That is all for my vanity decor picks, I'll probably go ahead with this after Christmas and have a look in markets for antique items. Hope you've enjoyed this post! Great post and timely as I'm currently decorating my study! I love, love, LOVE your picks! I, like you, love green, along with gold, so I tried to go with that for my vanity. Instead I ended up with a mishmash of mint, blush, gold and white. My vanity is so cluttered these days because I have so many palettes now. I need to find a way to organise them. 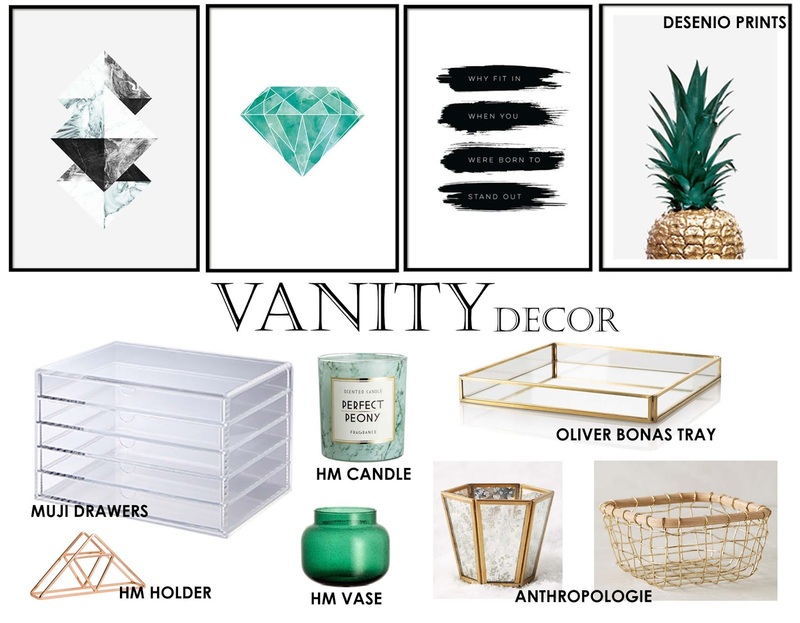 I really like the Oliver Bonas tray and the Anthro candle holder, super pretty and classy! I have those muji drawers and I'd definitely recommend them, they're so good!